Tossed in sweet balsamic dressing and toasted pine nuts with creamy Hellmann's® or Best Foods® Real Mayonnaise and topped with shaved Parmesan cheese. Makes a great dinner side. 1 Combine balsamic vinegar, Hellmann's® or Best Foods® Real Mayonnaise, rice wine vinegar, honey and olive oil in measuring cup or small bowl; set aside. 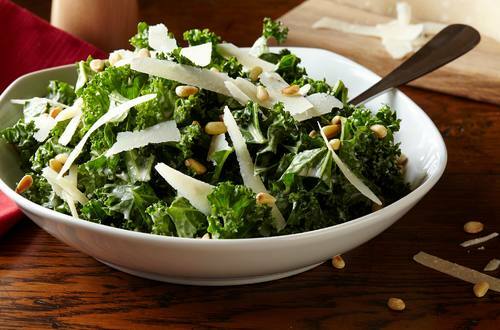 2 Place kale in salad bowl. Drizzle with dressing, then toss. Sprinkle with pine nuts and cheese.